A brass plaque rested for many years on the wall of an imposing stone building just inside the Lion's Gate in Jerusalem's Old City. Israeli troops came through this gate when they recaptured the Old City in the 1967 Six Day War. The plaque read "Domaine National Français République Française," French National Domain, French Republic. In other words, the French state has been claiming that certain real estate within Jerusalem is part of France. The label National Domain asserts that this is French sovereign territory. Un morceau de notre pays en Terre Sainte (a piece of our country in the Holy Land), as Jacques Chirac put it when he addressed an audience at the location, known as Saint Anne's Church, during his visit in 1996 (22 October). Lionel Jospin, the socialist prime minister, met local Arab leader Faisal Husseini there in 2000 (25 February). He was meeting Husseini and other prominent Arabs on French soil -- in French eyes at least -- rather than at Husseini's Orient House headquarters, which might be considered a victory for Israeli diplomacy. On the other hand, Chirac had wanted to show Israel "that France was mistress 'in her own country' when ... on his official visit to Jerusalem," he "demanded that Israeli troops" guarding him at Saint Anne's "evacuate this national domain during his meeting with the Latin Patriarch." The site is not a consulate or embassy, and thus should not have diplomatic exterritoriality, if that was in anyone's mind. According to Christian tradition, Mary's parents' home was here, and this is where Mary was born. 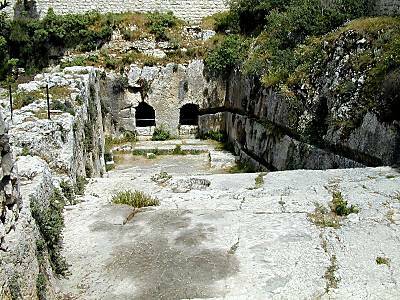 Be that as it may, the monks who administer the site on behalf of the French state have conscientiously excavated, so it seems, what were two massive pools built by Jews in Second Temple times, together called Beit Hisda (Bethesda). Now, Saint Anne's is only one of four sites in and around Jerusalem claimed as French. Each one has its story of how it became Domaine National. Saint Anne's was a Crusader church 850 years ago, then a Muslim school. After the Crimean War (1854) in which Britain and France defended the Ottoman Empire against Russia, the sultan of the day gave the ruined Saint Anne's site as a reward to his European ally (1856). Tomb of the Kings, where Queen Helene is buried. There is a contrivance in the grave whereby ... the mechanism, unaided, opens the door..." (Description of Greece, Loeb ed., 8:16:4-5). The tomb's beauty was recognized long ago and has been depicted in eighteenth century etchings and often since. Regrettably, the sharpness and beauty of the stone carving is less today than then. The tomb goes down two levels below ground and contains dozens of burial niches. Whereas Jerusalem Jews called the site Kalba Savua after the father-in-law of Rabbi Akiba, the traditional Arabic name was Qubur al-Mulk, meaning graves of the kings. Some investigators thought that the kings referred to were the House of David, increasing the site's importance in their eyes. The French archeologist, Félicien de Saulcy, held this view. He was able to get the agreement of the Sultan and the Arab real estate owner to his excavating the site and removing his findings. It was on this aspect that De Saulcy ran into opposition from the local Jews. They objected to his removal of Jewish sarcophagi from the site. Significantly, if we judge by our own time, the local Jews won the support of the local Muslim leaders for their position, much to the annoyance of De Saulcy. The governing pasha arrived at the location, "accompanied by the mufti, the qadi, and a rabbi" representing the Jews. 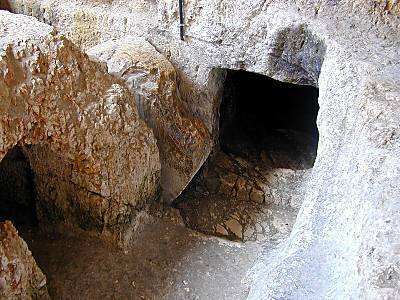 In other words, Muslim political and religious leaders recognized the tomb as a Jewish site. Today, few Muslim clergy anywhere would recognize any Jerusalem site as Jewish. It may be that the Muslims at that time saw the Jews as allies against encroaching European Christian powers, whose influence in the Holy City had dramatically increased after the Crimean War, as above. Indeed, Chirac pointed out in his speech at Saint Anne's that France, whether under a monarchy or empire or republic, had "an age-old tradition of active participation in the life of this part of the world," protecting the holy places, etc. This goes back to the medieval Charlemagne and through the Crusades and France's Capitulations agreements with the Ottoman Empire starting in 1535, which made France the protector of Roman Catholic persons in Ottoman lands and of Catholic interests in the Christian holy places in Jerusalem. De Saulcy called his Jewish opponents "scoundrels" and other pejoratives. Especially since they were blocking his schemes. Nevertheless, he extracted several ornate sarcophagi from the tomb, sending them to the Louvre in Paris, where they are to this day. One intact sarcophagus bore similar inscriptions in two scripts, Hebrew and Palmyrene, both in the Aramaic language, which strengthen the link of the tomb to Helen for several reasons. The inscription says: "TSada the Queen," presumably Helen's non-Greek, Aramaic name. De Saulcy decided to use the natural Jewish interest in the site to his own advantage. He came back to France and persuaded the Jewish banking family, the Péreires, to buy the site from the Arab real estate owner. The purchase was made in 1874. Several years after the Péreires bought the site, they were apparently persuaded that they could not care for and protect it from their home in France. They agreed to transfer it to the French state. Nevertheless, the transfer was made contingent on several stipulations. It was of utmost importance to the Péreires that reverence be shown for "the faithful of Israel." In fact, a brass plaque at the site proclaims this purpose. The deed of assignment (1886) states: "Article B. The French government commits itself hereby to a) not bring about in the future any change in the present purpose of this memorial monument... c) to maintain forever the abovementioned inscription, the text of which will be in French, Hebrew, and Arabic: 'Tombs of the Kings of Judah' and underneath this text will be written: 'This site was purchased... for the sake of science, for the sacred memory of those perfect in the faith of Israel, Amiel and Isaac Péreire"
The transfer of possession to the French state was a conditional one. How has France kept its commitments to the Péreire family? In recent years, France has used the site to promote -- Arab nationalism, obviously violating the conditions of the transfer. In this endeavor, the Arab group enjoying the French consulate's favor disregarded any Jewish connection to Kings' Tomb -- indeed to anywhere in Jerusalem. The group's director told Le Monde that Jerusalem had an "Arab and international heritage." No Jewish heritage in Jerusalem was acknowledged. This stance is in line with PLO/Palestinian Authority practice of course. On the other hand, the consulate states on its own website: "Tomb of... Helen of Adiabene... Converted to Judaism 30 years after J.C."
Yet the Tomb of the Kings has been used to promote Arab nationalism by allowing an Arab body, apparently associated with the PLO and PA, to hold an "Arab Music Festival" every summer starting in 1997 at this ancient Jewish tomb and archeological site. The festival (renamed "Jerusalem Festival") has enjoyed broad support over the years, not only from France, but from the European Union, various European governmental agencies, international organizations, "non-governmental" bodies, etc. The 2002 festival brochure lists funding support from Swedish International Development Agency, UN Development Program, Swiss Agency for Development and Cooperation, South African Representative Office, Ford Foundation, Pontifical Mission for Palestine, etc. The festival brochures that I have seen avoid any explicit mention of Jews or Israel. Thus, the 2002 brochure writes as follows: "The history of the Tombs of the Kings goes back to 45 AD when Queen Helen, Queen of Adiabin [sic!] or Mesopotamia, came to this region accompanied by her children. She chose the site 500 meters north of the the Old City and ordered the digging of the tombs so that she could bury her son..." Helen is presented as coming to Jerusalem for no particular reason, nor is her Judaism disclosed in any way. Note that the queen's Kurdistan origin is not specified either, also in keeping with Arab nationalist sentiment. To be sure, the brochures and web site of the festival are shot through with hostile remarks about Israel, although it is not mentioned by name -- only by insinuation -- nor is the presence of Jews in Jerusalem at any time in history acknowledged. The Jewish majority in Jerusalem in Helen's time as now, just as when the Péreires bought the site in 1874, cannot be mentioned. Indeed, one-sided complaints suffuse the material written by the festival's organizers and supporters. One complaint, made by an Arab public relations man, is that Israeli checkposts made it difficult for Arabs to come to Jerusalem for the festival. Of course, between 1948 and 1967, Jews could not get to the Tomb of the Kings (or the Temple Mount/Western Wall or other Jewish religious and archeological sites under Jordanian control) because Arabs excluded Jews in principle, not merely blocking them according to the security situation. This obviously cannot be mentioned. Further, the glossy covered 1998 brochure states: "The difficult situation of Jerusalem envisaged in dispossession and usurpation..." The gripe about "dispossession and usurpation" stands reality on its head, particularly in the historical and geographical context of this tomb. This context includes three nearby Jewish residential quarters whence the Jewish residents were driven out in the early months of the War of Independence when the Arabs had the upper hand. Of course, the festival organizers do not mention these neighborhoods, and they are regularly forgotten even by Israeli historians, so a brief review is relevant. Mere hours after the UN General Assembly Partition Plan recommendation (29 November 1947), Arab irregular forces began shooting at Jewish civilian targets in Jerusalem, Tel Aviv, and elsewhere in the country. Automobile travelers were murdered in Sh'khem (Nablus) that night; and an ambulance was shot at on its way to Hadassah Hospital on Mount Scopus. Throughout December 1947, the Shimon haTsadiq and Nahalat Shimon neighborhoods, close to the Tomb, on the way to Mount Scopus, came under attack, as did south Tel Aviv and elsewhere in the country. The Tomb is located in what became "East Jerusalem" after Israel's War of Independence. It is about 40 meters west of the Orient House compound, the erstwhile PLO headquarters in Jerusalem. The American Colony Hotel is some 60 meters to the north, whereas Nahalat Shimon is about 160 meters north of the Tomb, and Shimon haTsadiq less than a kilometer to the northeast. They are also in the area from which the Jews were driven out by Jordan early in the 1948 war, becoming Jewish refugees before there were Arab refugees. The Arab "squatters" who dispossessed the Jews and usurped their homes in 1948 have continued to live in them even though Israel took control of the eastern part of Jerusalem in 1967. Only about 50 meters to the west were the Siebenbergen Houses (where three new hotels are now located) along the Mt Scopus route. On their ruins to the west was built the later Mandelbaum Gate, the famous passage between Israeli Jerusalem and the Jordanian-held eastern sector in the armistice period between 1949 and 1967. Residents fled or were compelled by Arab and British forces to evacuate all three Jewish neighborhoods early in the war. Arab attacks with knives and guns were assisted, in the case of Nahalat Shimon, by British troops who forced the Jews to give up their weapons after the Jews had repelled an Arab attack. All but one of the Jewish families fled Shimon haTsadiq on the night of 29 December 1947. The remaining family fled on 7 or 8 January 1948 (exactly which day is missing from a diary shown to me by a family member). The British evacuated the now defenseless Jews from Nahalat Shimon on 17 January. Shimon haTsadiq became the first neighborhood in the country from which the population was driven out and did not return after the War. Jews had likewise fled south Tel Aviv in December 1947, but returned after the War, whereas Shimon haTsadiq remained under Arab control, as did Nahalat Shimon and the Siebenbergen Houses. Hence, precisely in the surroundings of the Tomb, Arabs and British dispossessed Jews from their homes in late 1947 and early 1948. This history does not appear among the suffering featured in the publicity of Yabous Productions, the Arab body organizing the music festival. Rather, advocating political militancy, if not violence by insinuation, the 2002 brochure exhorts in somewhat Stalinist tones: "Let Art & Culture be a weapon for the future!" Consider too: "The fight for the freedom of a country..." and "...this international event, where the music and songs ring out the messages of love and hate, fear and strength..."
Now, holding any entertainment at a tomb seems offensive -- violating the dignity of the dead -- as well as somewhat macabre. But the music festival at Kings' Tomb is all the more repugnant. It is clearly an Arab nationalist celebration at a Jewish tomb of much historical interest. A Jewish site is used for an anti-Jewish call to arms, thus violating the site's deed of transfer to France. Moreover, France (and other Western states and agencies) have tolerated or collaborated with -- if not sponsored -- several Arab falsifications of history in the Festival publicity, even if not agreeing with these falsifications. Furthermore, the French state has caused damage to antiquities on its self-proclaimed National Domain sites, thus violating the Israeli Antiquities Law. Jon Seligman, Jerusalem Regional Archeologist of the Antiquities Authority, notified Israel's Foreign Ministry (22 January 2001): "The French Consulate has conducted works at these sites, causing irreversible damage to antiquities and contravening the provisions of the law governing the right to conduct archeological work, using the claim that the sites are under French 'sovereign' control." A consular representative told Seligman that "the decision to restart the works without documenting the damaged ancient remains had been taken in the Foreign Ministry in Paris." Concerning Kings' Tomb, Seligman had complained directly to the consulate on 4 August 1996, about incorrect installation of a lighting system (perhaps for the purpose of the Festival) that had "damaged the rock" and might cause "progressive but intensive deterioration of the rock over time." He again complained to the consulate about work at Kings' Tomb on 4 September 2000. "The ancient tombs and miqva'ot (ritual baths) excavated by de Saulcy in 1863 are some of the most significant tombs found in the city of Jerusalem. Careful preservation and maintenance of these finds is important for the conservation of a site which clearly is of universal significance..." He mentioned the "severe damage" to the tombs caused by the electrical work in 1996. This scoffing at the antiquities law by the French consulate occurred not only at Kings' Tomb, St. Anne's, and the Pater Noster (Eleona) Church on the Mount of Olives -- all under Jordanian control from 1948 to 1967 -- but at a monastery in Abu Ghosh within the Green Line, under Israel's jurisdiction since 1948, and also claimed as French National Domain. On the other hand, the French consulate has not always been hostile to Jews, and this too should be remembered. In 1948, Arab forces -- local Arab irregulars, Transjordan's Arab Legion, and Iraqi troops (Iraq then ruled by a Hashemite, like Transjordan) joined later by Egyptians -- besieged the Jewish majority in Jerusalem. Food could not be brought in by road. Hunger was increasing. During the first truce (June 11 to July 9, 1948), "the Arabs prevented the flow of fresh water to Jerusalem," in violation of the truce. As to the amount of food to be allowed through the Arab blockade for Jerusalem Jews, "Jewish representatives had to conduct weary negotiations with Count Bernadotte and the Consular Truce Commission (made up of the US, French and Belgian consuls in the city), who wished to ensure at all costs that Jerusalem would be no stronger at the end of the truce than at its beginning." In this spirit, the US consul considered that 2,800 calories per day per Jewish inhabitant would be sufficient. On this issue, the French consul (and the Belgian) agreed with Dov Joseph, the Jewish Agency delegate to the Commission, that each Jewish inhabitant was entitled to 3,400 calories per day. Conversely, the US consul, John MacDonald, justified his position by pointing out that millions of Chinese were living on the verge of starvation. MacDonald's demand for only 2,800 calories won over the Frenchman and Belgian in the end (June 25). However, after protests, the daily ration permitted the Jews was raised to 3,100 calories per day a week later (July 1). In this instance, the French consul momentarily supported the Jews against representatives of other powers. One sometimes wonders if the French since De Gaulle have been trying to live down this episode in Arab eyes. On the issue of respecting archeological sites, France today is clearly hypocritical. The French government finances Patrimoine sans Frontières (Heritage without Borders), a body whose objective is "to perform operations to save the international cultural heritage, material or immaterial, and in particular, neglected, even forgotten, buildings, objects, skills, [and] sites." In fulfilling its purpose, this agency has undertaken salvage projects in Albania, Lebanon, Belarus, and Afghanistan. Yet sites under French government control have been abused, particularly the Tomb of the Kings. France has claimed a special status in Jerusalem going back to rights granted to Emperor Charlemagne by Caliph Harun al-Rashid. Today it claims four sites in and around the Holy City, on both sides of the Green Line, as National Domain, that is, French sovereign territory. This tells us that France has symbolic interests embodied in territory -- albeit token -- in Jerusalem where "our roots are deep," as Chirac remarked at St Anne's. These roots are felt as part of France's national identity, That attitude might interfere with Israel's needs and interests even without the Arab element. Further, at Kings' Tomb, France seems to again pander to Arab prejudices, as in the 1840 Damascus Affair, whether because of interests -- realpolitik or intangible -- or its own prejudices. We learn several lessons from France's treatment of the Tomb. France has interests in the Holy City other than "peace" between Jews and Arabs. It too makes territorial claims in Jerusalem. Now, by encouraging Arabs who demonstrate a refusal to make peace with Israel by denying any Jewish heritage in Jerusalem, the EU (which has also collaborated in the Arab Festivals at Kings' Tomb) shows that it too is driven by interests beyond bringing peace (or human rights, self-determination, etc.). It favors one side at the expense of respect for the dignity of the other side and respect for that side's history and heritage. Finally, Israel and the Jewish people cannot rely on solemn agreements, as France showed (with EU and other Western help) by its violation of the terms of transfer of Kings' Tomb to the French state. 4. Reuben Kashani, Historic Sites in Source and Tradition throughout the Ages (Jerusalem: BaMa`arakhah, 1968; Heb.) pp 74-75. 5. Rania Elias of Yabous Productions, interviewed in Le Monde, 23 August 2001; p 22. 8. Menahem Kaufman, America's Jerusalem Policy: 1947-1948 (Jerusalem: Institute of Contemporary Jewry, 1982), p 58. 11. Figaro, 6 June 2004; see under "Culture -- Patrimoine. Yehoshu`a ben Arieh, Painting the Holy Land (Jerusalem: Ben Zvi Institute, 1997), Etchings of Tomb of the Kings appear on pp13 & 16, painting of it on p 267. Yonah Cohen, Hakham Gershon miNahalat Shim`on (Jerusalem: Reuben Mas, 1968). M. Gabrieli, Gabrieli's Jerusalem Guide (Jerusalem: Marcus 1978). For Saint Anne's Church and Kings' Tombs. Palestine Post [forerunner of Jerusalem Post], read through issues for December 1947 and January 1948 for information on attacks on and flight from Shimon haTsadiq, Nahalat Shimon, Siebenbergen Houses. Ze'ev Vilna'i, Entsiklopedyat Vilna'i l'Yrushalayim (Jerusalem: Ahiever, 1993; in Heb. ), see articles on "Qivrey haM'lakhim," "Knesiyat Sent An," "Shim`on haTsadiq," "Nahalat Shim`on," etc. Ze'ev Vilnay, Israel Guide (Jerusalem 1984), see on Tombs of the Kings, pp 152-154.
http://ziontruth.blogspot.com/ showcases significant passages from ancient sources relating to ancient Jewish history and from Jewish poets writing about the glory of Zion and their hatred of Arab oppression, etc. This article was originally published in Midstream (New York) July-August 2005.